Can’t You See I’m Burning Burning? Publishers like genres. It tells them how they should market the books on their lists and it also helps them set expectations. Genre was the reason Jo Rowling was told she’d never receive a penny beyond her advance for her first book as kids’ books aren’t big sellers. I won’t say that I like the idea of segregating books by genre, but I can respect the intent of an author to adhere to specific tropes as long as they advance the reader’s understanding and don’t just signify laziness. Over the past few years I’ve read quite a few books that would be filed under YA in your local bookshop. It started a while ago with Junk (retitled Smack in the US). 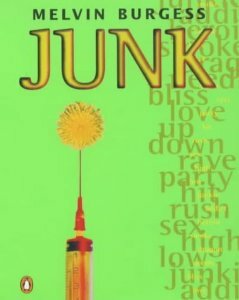 Junk is a devastating novel about teenage heroin users. It’s the opposite of everything you imagine and then much, much worse. I read it over 15 years ago and occasionally I’ll pluck it off the shelf or retrieve it from my kid’s room just to revisit a passage or two. It doesn’t take long for me to be right back there sobbing again over poor Tar such a beautiful and damaged boy and the story’s most heart-wrenching narrator. I have read few novels of any genre as powerful and as sad as Junk, but I kept returning to the YA shelves to pick out further gems for the kids. Three titles seemed to surface around the same time for me. Looking for Alaska by John Green, The Perks of Being a Wallflower by Stephen Chbosky and King Dork by Frank Portman. I wrote about King Dork in the first incarnation of this blog, but the other two books are equally worth your time. This past few months I’ve read two more terrific novels ostensibly written for readers much younger than I. The first was Code Name Verity by Elizabeth Wein which had nothing really to recommend it to me except a series of outstanding reviews. It’s a book about war and friendship and, yet again, it left me sobbing, nay heaving by the end. Maybe I’m just over-sensitive right now. Code Name Verity is a WWWII Girl’s Own adventure. On the Guilty Feat YA sadness scale where Junk is a stone 10 and Huckleberry Finn a mostly blub-free two, Code Name Verity is a solid eight and a half. It’s bloody good, too. The first thing you find out when yer dog learns to talk is that dogs don’t got nothing much to say. I think that’s a beauty. I whizzed through around 200 pages over shabbat and then finished the remaining 300 on the plane to Luton. Cautious world-building and relentless pacing. It’s a breathtaking work in many ways. It’s also part one of the Chaos Walking trilogy which means I have another two of these to get through. I’m going to try to buy them tomorrow. Let’s have a quick glance at this week’s chart from 1984. There are a couple of corking new entries which simply can’t be ignored. New at 37 was Nik Kershaw with his debut single top 40 hit “Wouldn’t it be Good”. I love this song. In fact I love all Nik Kershaw’s early singles especially the title track from his debut album Human Racing. “Wouldn’t It Be Good” is a classic 1984 single. Heavily synthesized. Slightly banal lyrics. Killer instrumental break. I got it bad, you don’t know how bad I got it. You got it easy, you don’t know when you got it good. 1984 was definitely Kershaw’s annus mirabilis. The first album delivered four hits and by the end of the year he had also released The Riddle giving him five top 20 singles in a calendar year. After that he never reached such dizzying heights again. Don’t wanna be here no more. You and me both, Nik, you and me both. Further up the charts there was a new entry for the Thompson Twins at no. 18 with “Doctor Doctor”. Sandwiched between two truly great singles, “Hold Me Now” and “You Take Me Up“, “Doctor Doctor” (“Can’t you see I’m burning burning?”) suffers from the comparison. Still It’s a good single and I may even have had a copy of the parent album, Into The Gap, on cassette at one point. New at no. 11 was the worst single ever by one of the greatest pop bands of all time. Outworsting “Union of the Snake” by a considerable margin, “New Moon on Monday” is a terrible misstep for Duran Duran. After the unarguable genius of Rio there was genuine concern that the Durannies were a spent force. To compound the fear, the album that was releasing these disappointing singles was called Seven and the Ragged Tiger, even then widely acknowledged as the worst non-prog rock album title of all time. 1984 was turning out to be a terrible year for Monsieur Le Bon, Regency Rhodes and the talented Taylor trio. History of course proved otherwise, but we will have to wait until May to find out how the boys from Brum turned things around. If you don’t remember what a bad Duran Duran single sounds like, brace yourself. The highest new entry went crashing into the charts at no. 4. Three years after their last top 10 hit, the majestic “Under Pressure”, Queen were under considerable pressure to prove they could still write hits. Fortunately for the band they had more than one songwriter to turn to when they needed something fresh. Each of the four single releases from their 1984 album The Works was written by a different member of the band. The first single was “Radio Ga Ga”, written by Roger Taylor (no relation). I missed out on seeing Queen on The Works tour. A few of my friends went. I’m still jealous. It must have been awesome. Currently reading – The Goldfinch by Donna Tartt – only 30 pages in, but loving it. Amazing discovery of the day – Mint-Flavoured Chunky Kit Kat. Think about it. It was only a few thousand years ago that we crawled out of the swamps and now someone has invented the Mint-Flavoured Chunky Kit Kat. Time travel must surely be just around the corner. This entry was posted in 30 Years Later, Books, King Dork and tagged Code Name Verity, Junk, Mint-Flavoured Chunky Kit Kat, Patrick Ness. Bookmark the permalink.